S President Barack Obama touched down in New Delhi yesterday, kicking off a highly anticipated three-day visit that will see him attend India’s Republic Day parade today. Here are the five things you need to know as the President arrives in the Indian capital. Obama will be the first US President to attend the January 26 parade, a Soviet-style jamboree to mark the day in 1950 India’s constitution came into force. Past invitees to the annual celebration include Japanese Prime Minister Shinzo Abe, Russian President Vladimir Putin and French President Nicholas Sarkozy. But that’s not all: when he lands in New Delhi, Obama will also become the first sitting US leader to visit India twice, following an earlier trip in 2010. Prime Minister Narendra Modi, who came to power following Indian national elections in 2014, travelled to the US in September, visiting New York City and calling in at the White House in Washington D.C. “It is rare for leaders, especially American presidents, to have successive summits so quickly,” Tanvi Madan, director of The India Project at the Brookings Institution, told TIME. Modi and Obama also met at the G20 Summit in Australia and the East Asia Summit in Burma last year. Another reason this visit is significant is that it symbolises a rapid improvement in US-India ties, which were nearly undone at the end of 2013 over a row involving Devyani Khobragade, India’s deputy consul general in New York. Accused of visa fraud and underpaying her house-keeper, she was arrested and strip-searched by U.S law enforcement, sparking angry protests and diplomatic retaliations from India. 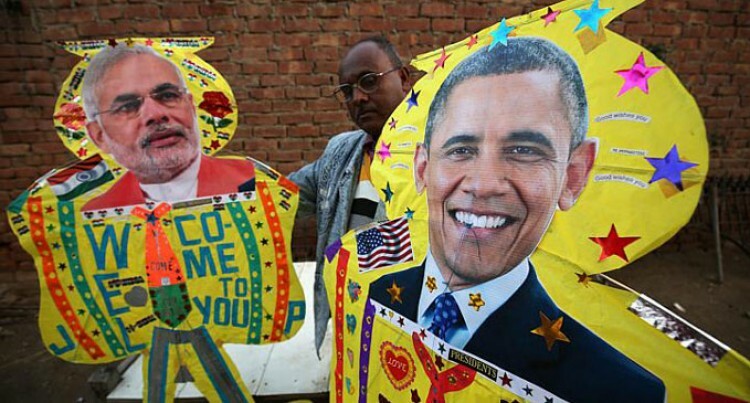 Modi and Obama will discuss a whole host of issues when they sit down for talks. Among those topping the agenda will be bilateral trade, climate change, increased defense cooperation and investment in India’s civilian nuclear sector, where a deal is being sought to break a long-standing impasse over a local law that is blamed for keeping foreign nuclear companies from getting involved in the Indian market. (It’s not yet clear if the two sides will come to an agreement in time for the President’s arrival.) Obama and Modi are also expected to discuss the regional geopolitical situation. This month’s ‘Mann Ki Baat’ episode will be a special one, where our Republic Day guest @BarackObama & I will share our thoughts together.